Crazy stuff happens on the local news all of the time, but we’ve never seen something quite as harrowing as the look of horror on San Francisco’s KTVU reporter Cara Liu as her newscast was interrupted by a group of armed robbers attacking the camera crew while they were filming a segment. You can check it out, below. On Thursday morning, the KTVU team was shooting a story about a murder at 6:30 a.m. alongside San Francisco’s KNTV team, when men in ski masks came up to the news crews and robbed them at gunpoint. SFGate reports that offscreen, a cameraman was pistol-whipped by an individual wearing a ski mask. Three men were part of the crew that stole camera equipment, and at one point, cameraman Alan Waples had a gun held to his head before he was pistol-whipped. Weather Bug meteorologist Jacob Wycoff released the video footage through his Twitter account. It doesn’t catch the robbers in the masks (although reports indicate one of the news teams caught an image of one of the men), but it does feature KTVU anchor Brian Flores attempting to introduce the segment before Liu panics and asks him to wait. She later disappears from the screen. Sorry, there’s an incident out here. This isn’t the first time this year that a local news crew was robbed live on the air. A few months ago, a news crew team and a reporter were mugged while filming and even managed to catch the culprits on camera as it was happening. Regardless, that event occurred in South Africa, pretty far from the continental US, where this website is based. It’s a lot different to see something happening elsewhere in the world than to see it happening in your own backyard, so to speak. 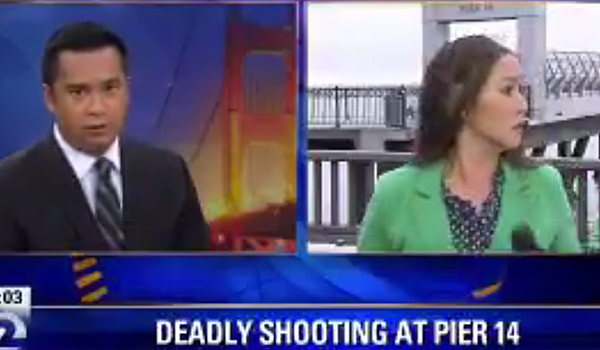 Even scarier is that the event happened on Pier 14—a thoroughfare regularly used by residents and tourists. With this robbery, Waples was the only individual who seems to have suffered personal harm. Reports indicate he has a large gash from getting pistol-whipped, as well as a bruise on his arm. Camera equipment was stolen from both news teams and tossed into a black BMW. All three robbers escaped the scene.